US President Donald Trump says NFL players who protest during the national anthem should be fired. Last year, quarterback Colin Kaepernick refused to stand for the anthem to protest against racial injustice and police brutality. 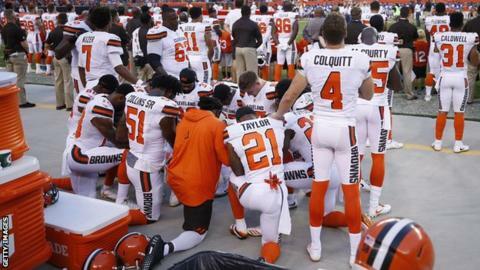 More players have since joined in by taking a knee or raising a fist during the anthem. Trump told a Republican rally in Alabama on Friday these actions showed "disrespect of our heritage". Several NFL players responded on social media, with Detroit Lions tight end Eric Ebron asking: "Does anyone tell Trump to stick to politics, like they tell us to stick to sports?" NFL commissioner Roger Goodell said: "The NFL and our players are at our best when we help create a sense of unity in our country and our culture. Having opted out of his contract with the San Francisco 49ers in the off-season, Kaepernick remains a free agent. The 29-year-old said he began his protests because he wanted to start a nationwide debate. Was ex-NFL player Aaron Hernandez a victim of sport's growing brain injury toll? Trump also encouraged NFL fans to walk out of the stadium if they see players protesting during the pre-game anthem. "When people like yourselves turn on television and you see those people taking the knee when they're playing our great national anthem, the only thing you could do better is if you see it, even if it's one player, leave the stadium," he said. "I guarantee things will stop. Things will stop. Just pick up and leave. Pick up and leave. Not the same game anymore, anyway." The US president's comments come at a time when basketball's champion team, the Golden State Warriors, are considering turning down an invitation to celebrate their NBA title success at the White House. Warriors player Steph Curry, the two-time NBA MVP, says the team can "inspire some change" by refusing to take the traditional trip to the White House. "I don't want to go," Curry told a news conference on Friday, adding that it would show that "we don't stand for basically what our president has… the things that he's said and the things that he hasn't said in the right times, that we won't stand for it. "I don't think us not going to the White House is going to miraculously make everything better, but this is my opportunity to voice that." How widespread is brain disease CTE in sport? Read more on How widespread is brain disease CTE in sport?